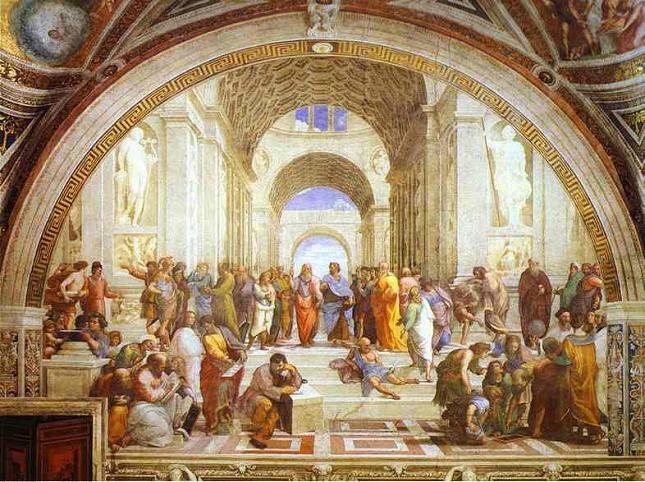 The philosophical and religious discourse that took off in Renaissance Italy is beautifully depicted by Raphael in the Stanza della Segnatura in the Vatican (Musei Vaticani). Pope Julius II, in the early 1500’s, commissioned Raphael to paint his private apartments. Raphael painted the frescoes of four Rooms. All rooms are accessible to visitors today, they make part of the Musei Vaticani complex, which are known as the Stanze di Raffaello (Raphael Rooms). One of these four Rooms is known as ‘The Stanza della Segnatura’, which is the very room that housed the Pope’s private library. For this Room, Raphael decided to make four frescoes (one on each wall) that depict the Renaissance newly (re)discovered Classical ideals in relation to the values of the Christian tradition. This choice of themes was meant to reflect the contents of the Pope’s library, the categories of which were : theology, philosophy, jurisprudence and poetry. Of course the most famous fresco in this Room is none other than the ‘School of Athens‘….